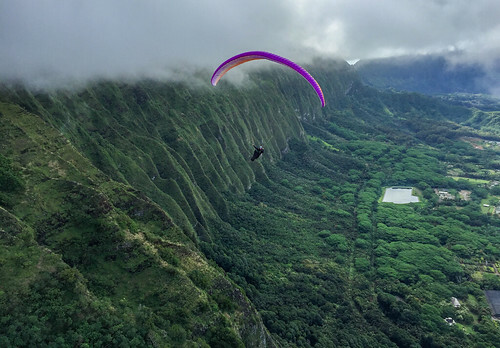 Today we flew fun cross country flights in the full spectrum of March conditions, from the most rowdy thermic leonine air at Kahana to the smoothest ovine air and the most beautiful cloudscapes at Makapuu. I was lucky to be involved in both missions, savoring a double scoop of aerial sweetness. I’m partial to thermals but I’ll take beautiful and smooth if that’s what it takes to get some company. I started the day off in my backyard, and lured several pilots out with promises of perfection. Well I knew it would be perfect for me anyway. It turned out to be the scratchiest gnarliest meanest thermal flight ever, my favorite, followed by a bay crossing and more scratching on the other side, and then a return trip to top land and wait for my pussies. I mean buddies. Visitor Portland Mark had already bailed to the beach with a snag in his lines. And Jeff had changed course for Makapuu. Thom was on the beach moaning about how he could smell his own farts because there was no wind. Even Allegra took one look at the conditions and bailed to Makapuu. I scratched around launch one more time and then headed down to follow those losers to Makapuu. I figured this might be the last day to see the whole crew for quite a while, since the forecast is for strong wind and showers for a week or more. Joey and Ray were launching tandems from Crazies as I arrived, and Thom and Frank and Allegra were kind enough to let me launch first. Frank and Jetflap had already flown, but Frank was back for more. Jeff, Ike, Maui Tim, Maui Justin and Doug (flying tandem) were in the air, later joined by Goto, and Jorge on a tandem. Thom was raring to go cross country despite the low cloud base, around 1,500 feet at the ridge. He blazed back to Puu O Kona and I swore I would not follow him under those low clouds if he paid me. Then I followed him. He swore he wasn’t flying in the clouds. He said there were big gaps and alleys to fly through. Hmmmmm. I met him at Puu O Kona and we dodged those fluffy monsters at Green Walls for quite a while until my comfort zone was breached and I knew I’d had enough. I headed back, and Thom followed. Back at Makapuu the clouds were even lower than before. We flew above the cloud banks as they wafted in low, marveling at the vast white vistas around us, and the brockenspecters below. It really was super beautiful. Finally we all landed and battled the rabbit poop rotor to get down to the LZ. At the end of the day Dave showed up and entertained us with an acro show. Thanks to Goto for the cold hang glider beverages, and to Tim and Justin for the cold Maui visitor beverages. Yup that about wraps it up for now. May the forecasts be as wrong as they have been. Cause I just can't get enough.